The person who wrote in asked Dan why things that make him immediately happy—like watching basketball or going out drinking—don’t give him a lasting feeling of contentment, while the things that feel more deeply meaningful to him—like his career or writing a book—don’t give him much daily happiness. I loved this question. It’s a dilemma I face daily if not hourly or minute-by-minute. I’ve been so busy the past few weeks with my book tour that I haven’t had many unscheduled days in which to be able to make these choices, but yesterday afternoon was one of them. My husband was out of town and I had caught up on paperwork and domestic chores. My foot is healing (I fell and tore a ligament in my ankle a couple of weeks ago) so I couldn’t use it as an excuse to watch TV all day and night, but that’s still what I wanted to do. I didn’t want to sit at my computer and work on my new novel. Happiness comes in two varieties. The first is the simple type, when we get immediate pleasure from activities such as playing a sport, eating a good meal and so on…. The second type of happiness is more complex and elusive. It comes from a feeling of fulfillment that might not be connected with daily happiness but is more lastingly gratifying. I thought about his words as I reflected on how “happy” I have been these past few weeks on a book tour for my first book, Tangles and Plaques: A Mother and Daughter Face Alzheimer’s. Each event—whether in a book store or a private home—has brought much immediate satisfaction. Reading and signing my book and discussing it with an audience makes me happy. But that book didn’t write itself. It didn’t just happen while I was watching TV or out drinking or doing other “fun” things. The social psychologist Roy Baumeister and his colleagues distinguish between happiness and meaning. They see the first as satisfying our needs and wishes in the hear-and-now, the latter as thinking beyond the present to express our deepest values and sense of self. They found, unsurprisingly, that pursing meaning is often associated with increased stress and anxiety. No wonder I don’t want to sit down and write my next book. What if I can’t do it? What if it isn’t any good? What if…. 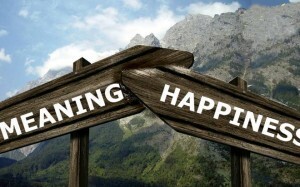 Simply pursuing the first type of happiness isn’t the way to live; we should aim to bring more of the second type of happiness into our lives, even if it won’t be as much fun every day. Again, this isn’t rocket science, and it might sound obvious, but I needed this reminder right now. Thank you for the post. This is very interesting to me. I am not entirely sure I know what happiness is. My goal is usually contentment, which I identify with “meaning” in your post. I hear you, Joanne. I want my goal to be contentment, too, and maybe as I get older I’m moving in that direction, but I still chase the elusive “happiness” quite a bit….